Today we colored pictures of a black cat, witch, ghost, monster, and bat. After we made bowling pins out of them for a Halloween bowling game. Before rolling the ball toward the pins, we named the pin we aimed at. If we hit the named pin we scored a point. Halloween bowling is fun. You should try it! 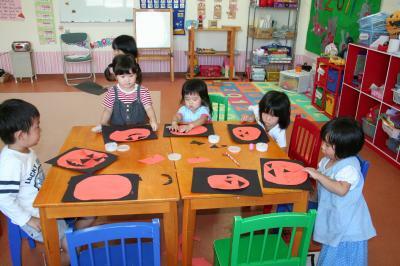 Today we made pictures of Jack-o’-lanterns using orange and black construction paper. Happy Halloween! Now that Sports Day is finished we can begin preparing for next month’s event, Halloween!. 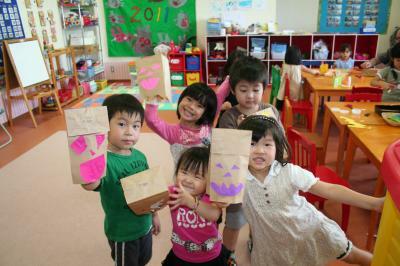 Today after our teacher read us the picture book of “A Book of Ghosts,” we made our own ghosts using a paper bags! 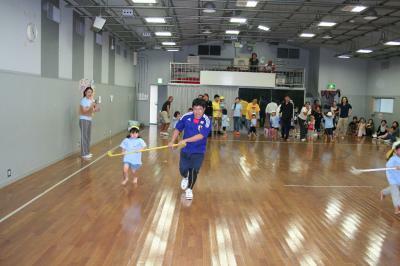 On Sunday, September 25th, we held our long awaited Sports Day! 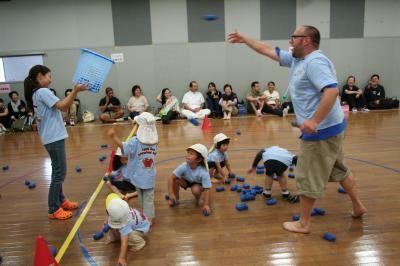 We had fun running races, dancing, and playing games with our parents and teachers. Thank you to all families for your support and thank you for coming to our sports day! See you at next years Sports Day! 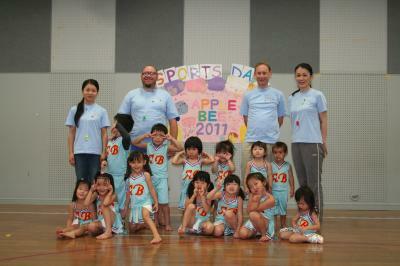 Apple Bee’s Sports Day is coming this Sunday! 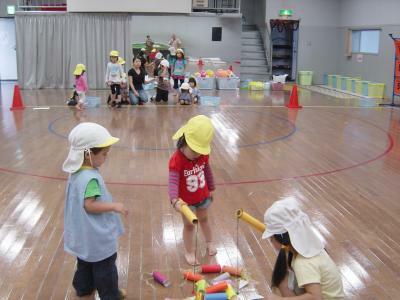 Today we practiced some of our events: foot race, fishing race, Tamaire, bread eating race, our dance, 3 legged race… We all are looking forward to Sunday with our parents and friends, and our sports day. Please wish us luck! Today our teacher showed and told us about a toy he found when he visited Mexico. Look closely, can you guess what it is? 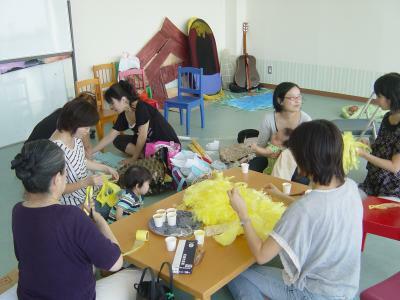 Our Mommies & Grandmas are preparing nice costumes for us to use in our sports day performance. We will be dancing the Y-M-C-A dance and we can’t wait to put them on. Thank you Mommies and Grandmas! Today we made sign for our up coming Sports Day. This month’s theme is “All About Me.” We are learning to explain things about ourselves and our families in English. This week we are making posters that explain all about ourselves. We wrote our favorite foods and colors, pasted photos of our families, and included our self portraits. Learning about our selves and others is fun! You should try it! 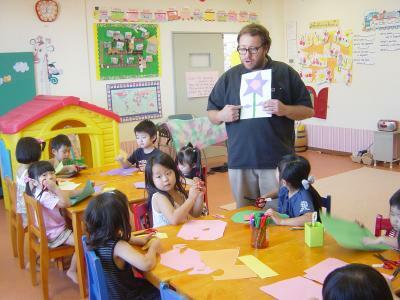 Today we made flowers out of colored construction paper. We cut paper into various shapes like triangles and diamonds. Then we then pasted them to make beautiful pictures of flowers. 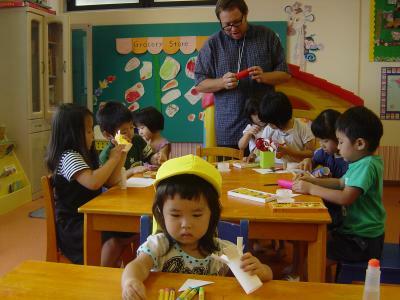 This helps us learn the names of shapes in English, and to memorize them. We hope you like our flowers! 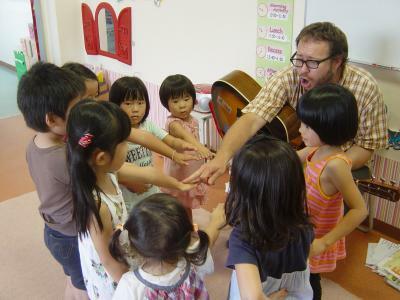 Today our teacher played the “Hokey Pokey” song on his guitar, and taught us the “Hokey Pokey” dance! Today we held a birthday party for two of our friends! We sang songs, heard stories from their mothers. 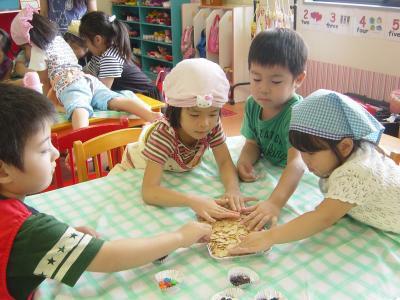 Our teacher showed us how to make an American snack. It was very sweet, but we liked it. It was fun! We made a lot of fish, and now we are making a pond to put them in. Today we cut paper to use as grass to put around our pond. We are learning to cut, and use scissors safely.Safety is very important! 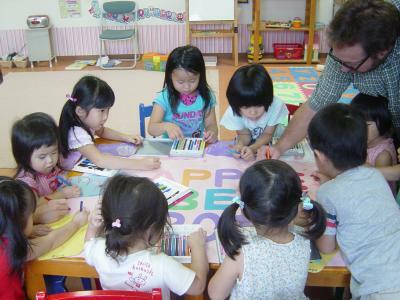 This month we’re learning about other countries and how to greet people in different languages. 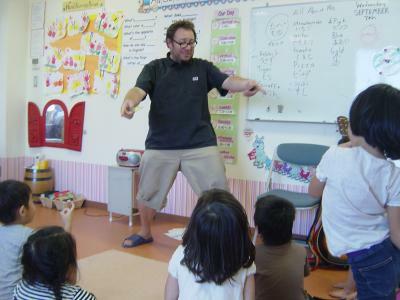 We are learning how to greet people from France, China, Korea, Egypt, Italy, and India.Greeting people in their own languages is very important. It shows respect for other people, and helps us all to be friends. It’s also a lot of fun! 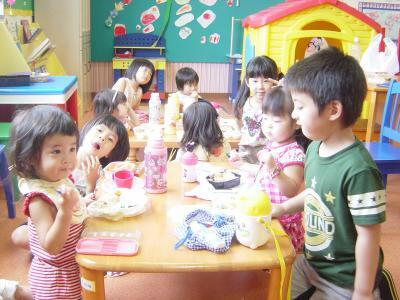 Today for lunch we had salad, fish, nikujyaga, tamagoyaki, and rice. We ate eveything! We love lunch time at Apple Bee! 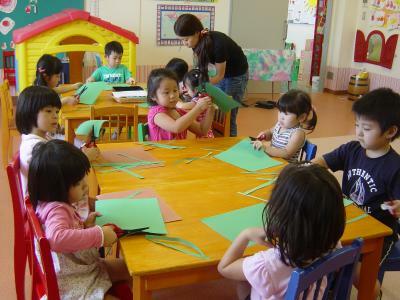 Today we made colorful fish using paper and paper rolls, and decorated them with crayons. We will use our fish in a fun race at Apple Bee Sports Day!